See the * on the building next to the Sea View hotel. That’s where I usually hang out in the 70s, 80s and 90s. The old Katong Yaohan there with Ikea on the second floor…then we have the old Cold Storage taking over the place there too. Shopping seems so easy and close to my house at Haig Road. Thinking back, I wonder why I liked to go shopping at Katong Yaohan and Cold Storage there even though I don’t have much to buy? Maybe just to enjoy the aircon haha. As for the hotel, I had been to the restaurant a couple of times only with my clients. In the 70s, this Sea View Hotel must be a luxury hotel too. But in it’s last decade, it’s just a 2 or 3 star hotel. 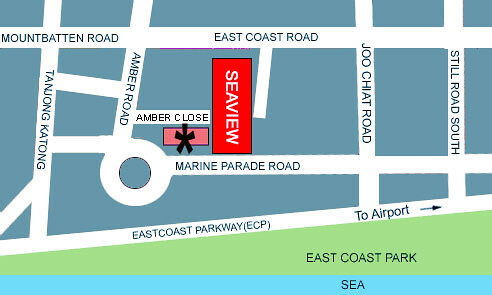 When I started to shift in together with my parents in the 70s (around 1976 when I was in Sec.2) at Haig Road, the Sea View Hotel was already there near the Amber Close. So I’ve not seen the ‘Old Sea View Hotel’ at Meyer Road. I’m sure Peter has seen it as I remember he mentioned something like ‘dome’ shaped building at Meyer Road when I posted the topic on Haw Par Villa previously. – 1931 to 1962 : Taken over by the executors of the estate of late Manasseh Meyer. 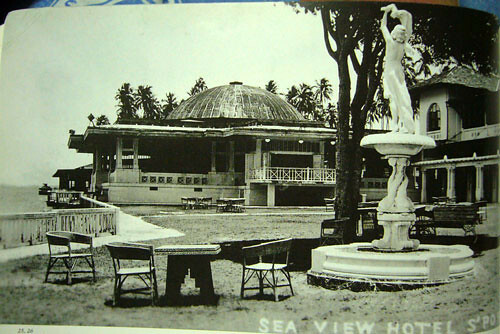 Sea View Hotel Ltd became the proprietors and operated till 1962. 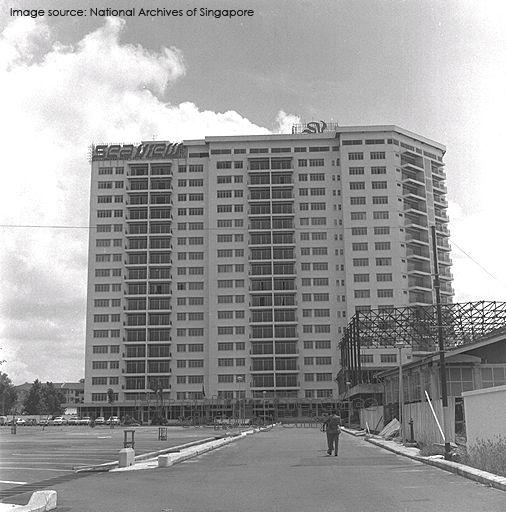 The Peach Garden condo replaced the site occupied by the Old Sea View Hotel in 1976.
Credit : Shell, Singapore Government Survey Department. Note the location of the Sea View Hotel in the 50s. Also a number of roads like Marine Parade and East Coast Parkway were not built before the land reclamation. Of course the shoreline was immediately after the Amber Road and Sea View Hotel really means sea view. Read more about the Old Sea View Hotel. Read about how Grove Hotel became one of the 2 annexes of Old Sea View Hotel. 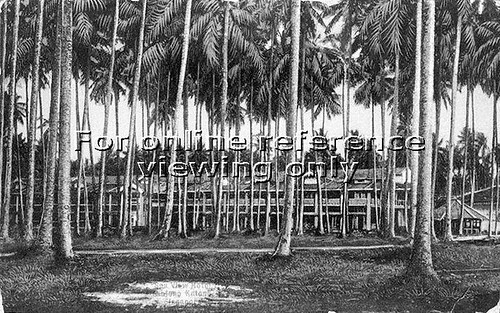 So the Old Sea View Hotel started off as a large colonial bungalow situated at the sea front surrounded by coconut trees. Now both the old and new Sea View Hotels are gone…and both sites are replaced by condos. Should have taken some photos of the new Sea View Hotel before it was demolished. 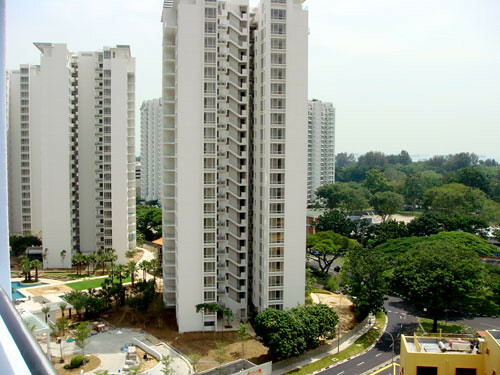 Actually it began life as a private apartment, so u see the hotel is the only one in Singapore with balcony. 1. The ground floor bar (on the left when u enter the main entrance). back in early 1980s we used to come here for drinks because there was live music by a Filipino band. Many Katong girls hanged out in this place besides Honky Tong Lounge over at Tay Buan Guan Bdlg. Then many call-girls invaded the place and customers took them across the road to Amber Hotel or Kin Sun Hotel because these 2 hotels offered hourly charges l=not like Seaview which had daily room rates. Finally anti-vice closed down the lounge. 2. The coffee house on the right side of the main entrance because they offered Pernakan buffet at $15/++. Best was ice kachang and laksa. 3. The green and off-white mosaic floor on the ground floor and in the hotel rooms. Never carpet the hotel rooms. 4. Carpark was worth it. $1 can park the whole day, then they changed the policy for limited time parking. If u shop at Cold Storage supermarket, can redeem carpark charges. Only carpark (before the auto barrier system installed) where u can negotiate with the carpark attendant for free parking (up to 15 mins). Lao I got a question. The Haig Road food court behind the former Hollywood; what happened to the famous wanton noodle and the char kway teow stalls? Yes I remember the new Seaview Hotel in Amber Close. However, I didn’t know there was an older Seaview Hotel until I read your post. I personally know someone losing a lot of money on Seaview Hotel’s shares in the 1960s though. What a wonderful post! Thanks for triggering off many fond childhood memories. I remember that there was a Thai Sharksfin Restaurant in the “new” Sea View Hotel. My boss treated me to a good dinner there once in 2002 or 2003. If not for your post, I would have forgotten all about it. Of course, the Ikea there was so tiny, compared to the mega stores in Alexandra and Tampine now. I remember that the Ikea cafe was almost always deserted; unlike the very-popular Friends Cafe at the 2 Ikeas now. How times have past, and how things have changed. Once again, thanks for the post! Replied to your email. Yes, the best is still the $1 parking charges. But then, parking then at Parkway was not so difficult as now and cheaper. There isn’t any foodcourt behind Hollywood. Only the very small coffeeshop or hawker centre. The Hawker centre and wet market is undergoing renovation now and will be ready in April. The 2 stalls you mentioned still at the small coffeeshop last year (Jun) when I was there. But taste not the same.. Same as you I wasn’t aware of it until I came across some old postcards. I was surprised that the old one wasn’t at the same location but at Meyer Road. Even when I drove past that Amber Close now, I’ve totally forgotten about the Sea View Hotel. Though that few old housing blocks still there (about to go too) and the florist shop also still standing, the rest of it have changed. Really missed that place. I vaguely remember the building marked ‘X’ i your map as you enter from Amber Close. If I am not wrong, it was a block of apartments that was for some airline’s crew I think – either ANA or JAL. 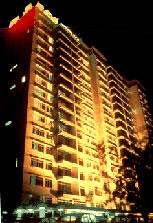 The block of apartments was for a Taiwanese airline – EVA AIR. UNiform was green colour for the stewardess. 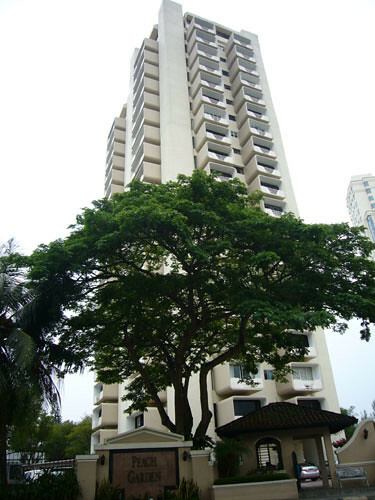 If i am correct and my memory did not fail me, the EVA AIR white colored apartment to the 4 storey block of private flats opposite Amber Hotel was once a part of Datin Lee Chee San’s villa called “Katong Villa” or something to that effect. When I was about maybe 5+ or 6 years old my father brought me to swim in the sea of Chinese Swiming Club. Back in 1959 or 1960, there was no EVA AIR apartment but a huge bungalow property. To get into that club, must enter by Amber Road from Rose Garden side. 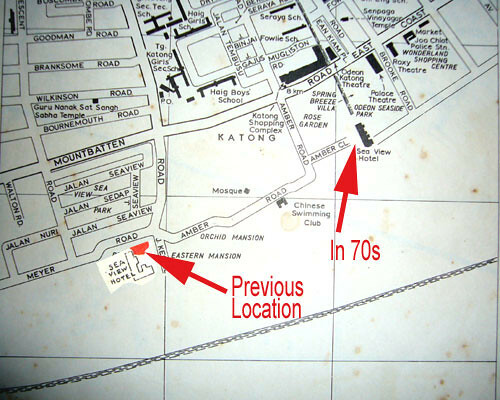 The other way was to enter by Tg Katong Road which lead to Meyer Road where the former Eastern Mansion stood. 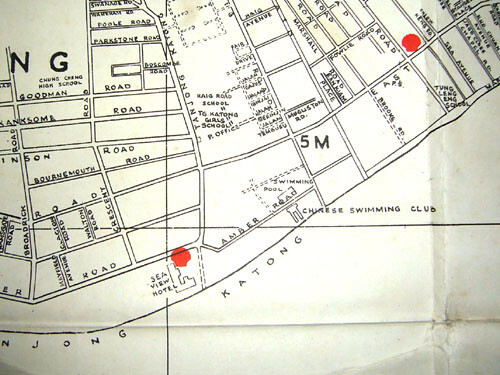 At that time Meyer Road was joined to Amber Road; the present Tg Katong South to the ECP was Kg. Amber inhabited by the Malays. The present Tg Kaotng South to ECP never existed in those days. U can still see the old Tg katong Road to Meyer Road bcos it is next to the row of semi-D houses. So two prominent buildings still stick in my head. First Amber Hotel facing Datin Lee’s huge bungalow and second the old SEAVIEW Hotel (bcos it had a crescent-shaped building as one of the hotel wings). My mistake. The villa was called “Mandalay Villa” owned by a Lee Choon Guan. My family used to park beside Seaview hotel. There’s a lane between Sea view and some terrace houses. We will park in that lane, then walk over to Katong Shopping Center to buy pirated games and then to Parkway Yaohan to shop and to MPH for books and mags. When we needed furnitures, we will go to Ikea which was just above cold storage and beside Seaview hotel. In the mid 90s, a bunch of guys from the local BBS hosted Singapore’s one and only Demo (some graphics showcase on the PC) competition at Seaview hotel. Soon the whole Katong area will change. So many buildings in that area is up for enbloc. I don’t know…. why do we call this place home when everything that brings back fond memories has to be demolished to make way for things we have no feelings for. When we make changes like this, what is it at the expense of? Oh yes. Google for “Seaview Hotel” and “Singapore”. A number of hotel websites still have Seaview hotel in their list of hotels. 🙂 Can find a couple of images. Anyone got memories of Grand Hotel? It’s hidden along Still Road, in 2-halves, one on each side. 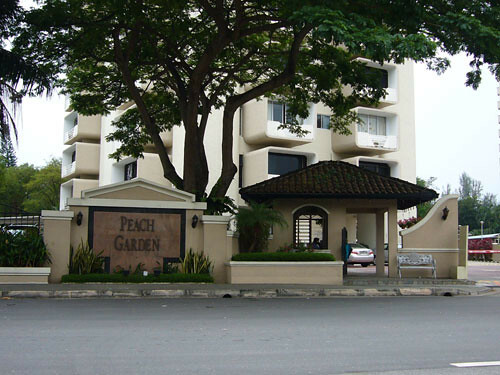 The Bali look-alike condo in front of the former Grand hotel (facing Marine Parade Road) was once a part of the hotel property. The old seawall (granite) with the concrete steps to the beach are still there (there is a pair). This should give an idea of the original sea-level and the beach. The concrete steps lea dinto the present drain. There was a WW2 pill-box where the bus-stop stands in front of the former Katong Convent School. 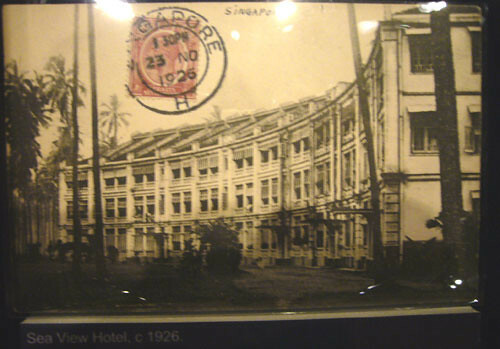 Old name for Grand Hotel = Hotel Karikal. Present Still Road to ECP was the original road leading into the hotel property. There was a fountain at the end of this road (I think opposite to the present bus stop). Fountain reminded me of the same design at Elizabeth Walk but smaller in size. I came here to swim around 1960. Good info Peter on the Grand Hotel. Tt really bring back fond memories of this area, my mum used to bring me to Yaohan in the 80s’…and I notice there is a 2 storey building next to Yaohan, tuck at a dark corner, nearer to marine parade rd. The building has tinted color glass as window, wonder anybody notice it and was it still there since the whole place revamped. Hey I think I found some old personal photos of Seaview Hotel. Any interested? Thanks for reminding me of those breezy seaside places and the nice slow pace. 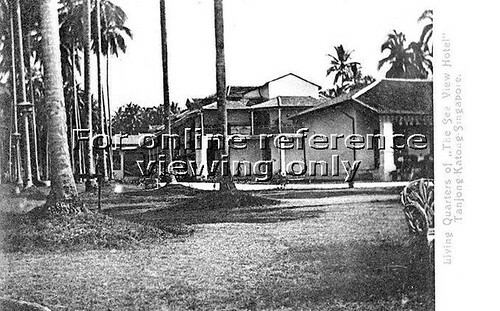 Also of the old Katong Park and the Ambassador Hotel across the road. Does anyone know if the Old Sea View Hotel was open at all during WWII? and if so, only for Japanese or for anyone who could afford to dine/stay there? Stayed at the old Seaview in the 1950s & 60s. Very nice hotel. Does anyone remember the swinging ‘saloon’ type doors? Also the restaurant over the water? Stayed at the new Seaview Hotel once in the mid 70s, not so good. It will be great if you still have photos of the old Sea View hotel, Doug Mein. Glad it helps you in your school work. I too would really like to know more about the history of this stained glass building. 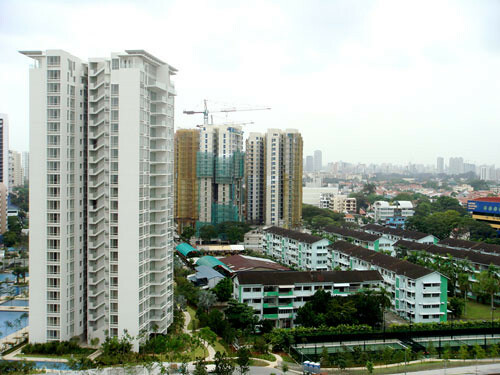 I lived in Singapore between 1975 to 1995, and have fond memories of Katong. This building, however, has always haunted my thoughts. I used to go to the old Seaview Hotel for dinner but it was so long ago – back in the mid-fifties. Can’t even remember the food that was served then (though I know it was delicious). Does anyone know more about the restaurant and food then? Was there also a live band and dancing? Anyone has any photos to share? I used to work in Sea View hotel as reservation dept in late 90’s, it was my first job. I am trying to find my ex collg who used to work with me. I remember every single thing in hotel. At that time, there were renovation for all rooms. Thank you for showing the old pictures of hotel. I stayed at the new Seaview Hotel in the 70’s on a 2 daystop over from Australia to UK. I remember being on the top floor restaurant enjoying a meal and the entertainment from a live band, when the building started to sway quite heavily, enough for glassware to fall from tables. Everyone started to scream and vacate the building. We found the stairs and were nearly trampled by folk desperate to get out and away from the building. Needless to say, many people stopped on the road to see what would happen but fortunately nothing did but we didn’t go back in for many hours and I was pleased to leave for UK next morning. i am looking for a nice photo of singer sally chia singing in the lounge at seaview in 1986 if not maybe a advertising poster from there or the strawberry theatre lounge , and plaza hotel in 86,87 having trouble finding information. I remember staying on holiday at the old seaview hotel and playing on the grass/sand infront of the rooms which always seemed grand. The front room was open plan and magic to a five year old. My parents sed to enjoy a good curry on a Sunday. It always amazed me to be able to look over the sea wall at the waves crashing against it. Thanks for posting a picture of the domed restaurant.. Happy days! I pay a quick visit every day some websites and information sites to read content, except this web site provides feature based articles. may be incredibly profitable. are Binary Options a Scam is among the greatest are Binary Options a Scam brokerages on the web currently. general skepticism regarding stockbrokers within this industry. investment decision, plus your specialist fees should you help to make the incorrect a single. 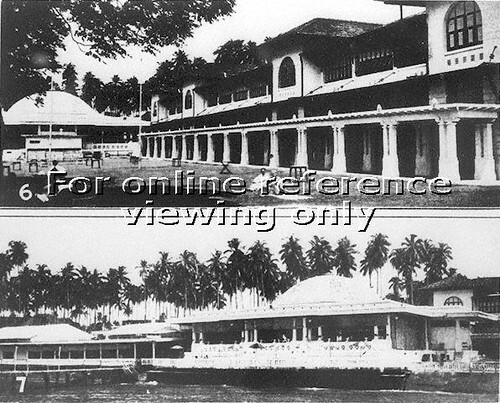 A Tamil movie “Ulagam Sutrum Vaaliban” was shot in Sea View Hotel 1970. Picture from the same blogger. His article about Singapore background for movies. I wonder if I can leave a picture somewhere here. It’s of the “old” Seaview Garden, 1946 to be precise. Our family next to the statue which you see in the photo above, marked: “The dome-shape building….” Anybody interested? I would very much like to see your picture of the old Seaview garden. hi, i was just looking for photos of the Sea View hotel I stayed in as a child – must have been sometime between 1954 and 1958. The photo above that triggered memories was the one that says “around 1937”. But I do remember the arcade – it leads to the restaurant as I remember. There was some sort of festive dinner and my tiny sister and I crept from our lovely room to see what was going on. The arcade was festooned with brilliantly coloured flowers and masses of hanging greenery, and lots of Chinese lanterns, and lights I think – it was magical. Our family were living in Brunei, Borneo, where my father was working, and I think we came to Singapore, and to the Sea View on a holiday. Our parents were at the dinner. Someone – can’t remember if it was another guest, or one of the hotel staff, saw my sister and I gazing in delighted awe at the arcade and took us back to our room. The rooms were lovely. There were lots all on the ground floor long and narrow, with huge ceiling fans, and mosquito nets around the beds. Each room had it’s own long narrow courtyard, and we sat outside to eat our breakfast. At the end of the courtyard was a gate – and through there was, Yes, some sort of concrete barrier and then the sea. My general memory of the hotel is that of wonderful rustic charm – our stay there is certainly one of my very happy childhood memories. I remember staying at the sea view hotel in the mid 70s when working for shell tankers when you left a ship or joined one you were always put into the sea view before and after your flight. 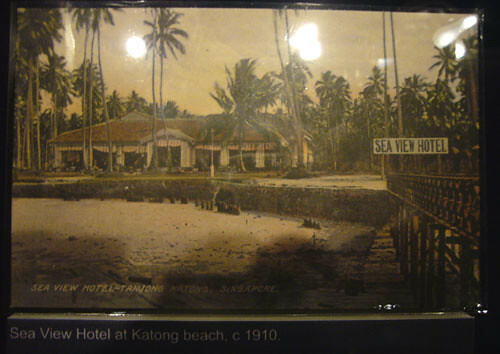 I have 2 photos taken of the old Sea View Hotel by my grandfather back in approx. 1910. One of them is almost identical to the 1910 one, with the tide in. He was probably there on r n r from his work in railway construction on the East Coast Line, or on his way home to GB on leave. I too lived in Brunei in the Fifties and when passing through Singapore often stayed with my parents at the Seaview. I remember well the classical statues on the lawn, the saloon doors into the rooms, the snake charmer on Sundays, the little shop at the entrance, and above all the beautiful domed dining room where you could overhear people speaking at distant tables, sparrows flying around, and the wonderful nasi goreng on Sundays. Singapore, I still love you. Interestingly I was chatting with an uncle two days ago about changes of our environment and I was telling him about the yaohan and the hotel around marine parade. He finally remembered the name Sea view! And today I read about seaview condo residents unhappy with the quality of their condo and taking the matter to court. Once again Sea View! Hence I am here now posting this comment after i did a search on seaview hotel. Thank you for the article and the pictures. Do you have any pics of the 1960s when you went to the CSC to swim? Delighted to see messages from old friends like Doug Mein (2010) and Donald Whitaker (2015) who had also stayed at the old Sea View Hotel (Meyer Rd) on their treks from KB, Seria Lutong and Miri. I wonder if there is also a site for the old Raffles Hotel! I was just consulting the web for a caption to an old B&W photo of me age ~ 4 years (now 72y) playing out in front with the old pavilion style rooms in the background. We had returned from England on the “Oranje” c April 1949. In particular I can remember being mesmerised by the sea waves lapping up against the sea wall at high tide and the swirling flocks of swallows (?starlings), but also all the other things mentioned by those of us who still have a few remaining neurones. Interesting to see the original (1909) hotel owner was a Manasseh as I was to go to School in England with a “well to do” member of said family, but do not think his grand dad would have owned it, but who knows? He never mentioned it to me. We also used to stay at “Memberdai” on Labuan Island with its beautiful cliff path down to the bay, but I can find nothing of this establishment on the web!